Each year I try to mix it up a bit, and this year I was so inspired from seeing such fun creative ideas at the different link parties I participate in. The ones that inspired me, were the ones from House of Hawthornes peat pots. My other major inspiration came from GraphicsFairy.com. I am so inspired every time I go to her site. My head starts spinning with ideas. 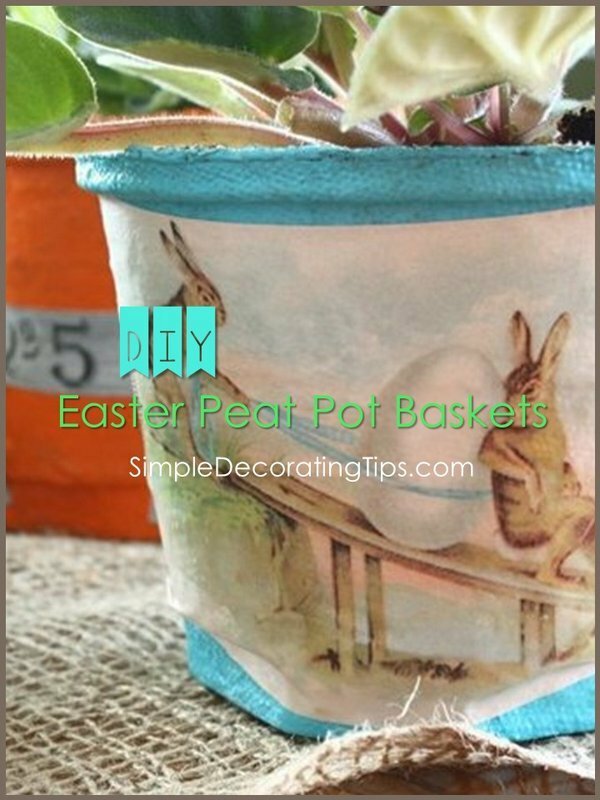 Choosing coordinating colors from the prints, I painted the peat pots different colors with acrylic craft paints. Leaving the inside of the pots the natural brown color. I Mod Podged the bottom just for a little added protection for the peat pots, then I set them to dry inverted on glasses. They totally remind me of a version of the antique paper mache ones I’ve seen at antique sales, but these were so inexpensive to make and a really fun craft. Instead of making them all baskets for the table centerpiece, I was inspired to use them to hold small pots of flowering violet plants. Love the fresh colors with the vintage graphics! Stopping by from Skip to My Lou, very cute!!! Your pots look lovely! I want to make some…., congratulations! These are sooo cute! Love the colors you chose. These are adorable, and have such a great vintage vibe to them. Well done! I wanted to invite you to join my How To Tuesday link party, if you haven’t already joined . It would be wonderful to have you! Those are adorable! I want to make more of these now! Thanks for the shout out also!!! Wow! These are really cute. Nice job!